Digital twins are becoming a business imperative, covering the entire lifecycle of an asset...and forming the foundation for connected products and services. Companies that fail to respond will be left behind. As defined by most industry analysts, digital twins are unique software representations of individual assets, systems, or processes that enable companies to achieve improved business outcomes. A digital twin can represent a functional asset (including fixed or rotating equipment), a component (a pump, motor, etc. ), a system of assets (a turbine, jet engine, MRI machine, etc. ), or a fleet of assets (a wind farm, a combined cycle unit, an aircraft, etc.). The level of representation is determined by the targeted business outcomes, e.g., reducing unplanned downtime of a compressor compared to optimizing power generation output. But it is not the technology that gets me going on this topic, it is the value I see it bringing to our customers’ digital industrial transformation journeys every day that inspires me. We’ve seen customers increase reliability from 93% to 99.49% in less than two years, reduce reactive maintenance by 40% in less than one year—contributing to significant maintenance cost savings, and save $360K by predicting a power outage in a gas plant. These kinds of results are what challenge our team at GE Digital to keep innovating and building more and more digital twins for customers. So, while the digital twin serves as a proxy for the physical asset, system, or process in the digital world what makes a digital twin unique and useful is its ability to provide insights into current state, performance, and health of assets and processes as well as insights into future options to optimize assets and operations. What makes up a digital twin? Knowing the current context and predicting the future state of a digital twin means we can effectively monitor, simulate, and manage an asset, system, or process, and optimize business decisions about them, including improved maintenance, upgrades, repairs, and operation of the actual asset or the plant/fleet itself. As I’ve mentioned, digital twin technology isn’t just utilized on individual assets. Think about how kids create with Lego blocks, the same concept is true for digital twins. We build and leverage digital twins providing unique insights to a wide range of personas. So, if you’re a reliability engineer, digital twins can provide you with reliability insights, if you work in the maintenance organization, digital twins can provide insights into maintenance needs, or if you’re a fleet advisor you can get insight into risk management, etc. This is a digital twin of a component of an asset, such as a bearing on a rotating piece of equipment. The component twin is typically a major sub-component that has a significant impact on the performance of the asset to which it belongs. This is a digital twin of an entire asset, such as a motor or pump. Asset twins can be collections of and informed by component twins. Asset twins provide visibility at an equipment level. A system or unit twin is a collection of assets that together perform a system- or network-wide function, such as a unit within an oil and gas refinery or production line in a factory. This type of twin provides visibility across a collection of equipment. A process twin is typically the highest-level twin that provides a view into a set of activities or operations, such as a manufacturing process. The process twin can be informed by a set of asset or system twins but focuses more on the process itself rather than the equipment. With all four types of twins, industrial organizations can get different perspectives but a similar point of view. Depending on roles—from the operator to the CEO—each twin type can provide unique insights to inform different aspects of an operation as whole. 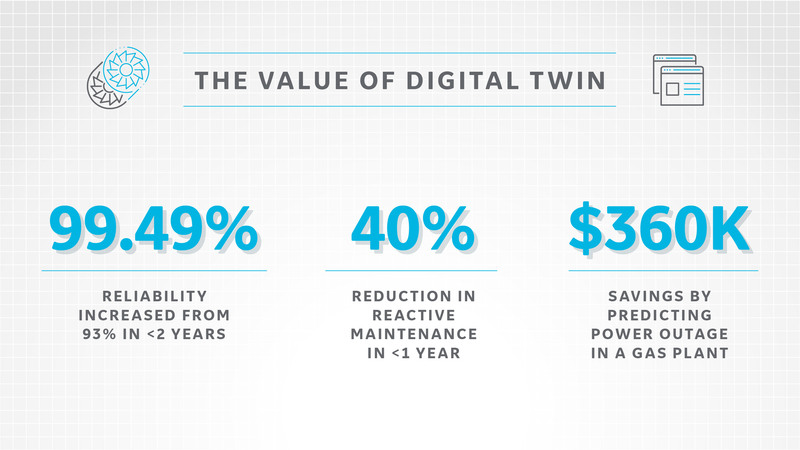 Why GE Digital’s digital twins? Our goal at GE Digital is to think more about product than projects when it comes to digital twins. We want to create a repeatable, scalable catalog of digital twin templates that span across industries, across assets class, across asset types–for both GE or non-GE equipment. We are building digital twins for assets, systems, and processes so that your organization can drive significant business outcomes. We have a rich catalog of digital twins that are available to customers today and we are adding to it every day. Leveraging the catalog means customers can quickly deploy digital twins—accelerating implementations and shortening time-to-value of their asset performance management (APM) projects. Our catalog also enables our customers to “double click” into the industrial DNA of GE and leverage our experience in designing, building, operating, and maintaining industrial assets. Whether you’re a maintenance engineer, production manager, or C-suite executive the key to being successful in this digital industrial era is how to monetize your assets to gain better business intelligence. The way you do that across the entire asset value chain—digital twins. With more than $1.05B customer, production, and mechanical losses avoided I’m excited about the real promise of digital twin technology for our industrial customers. This cost savings can’t be ignored. Are you with me now on digital twin technology? John Renick is Senior Director of Digital Twins and Content at GE Digital. Over the last 18 years he’s worked with asset-intensive industries to define, grow and deliver asset performance management (APM) solutions. Learn more about GE Digital's digital twin technology and read how digital twins can help industrial organizations increase asset reliability.